Updated: Dec. 10, 2018, 4 p.m.
Dana Smith has seen hard times — and now her greatest joy is watching others overcome. 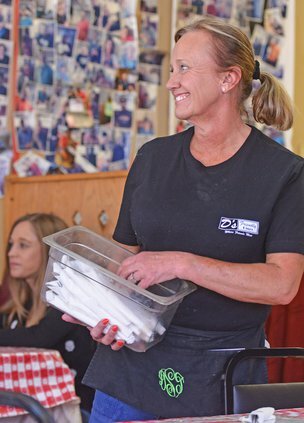 Smith, who is the owner of D’s Friendly Diner in Statesboro, was a nurse years ago, but her addictions cost her everything. She lost her job and her home, and she says her active addiction was “really bad” for about 10 years before she decided to get sober. She would have sought help sooner, but was unsure where to turn. She says that getting caught with some opiates was a blessing in disguise. Smith graduated from her recovery program two years later, and was able to land her first job, working at McDonald’s. She later went to work at Mr. Omelette, which was at that time in the same location as her diner. She says that the three years she spent working there was a catalyst for her own growth. 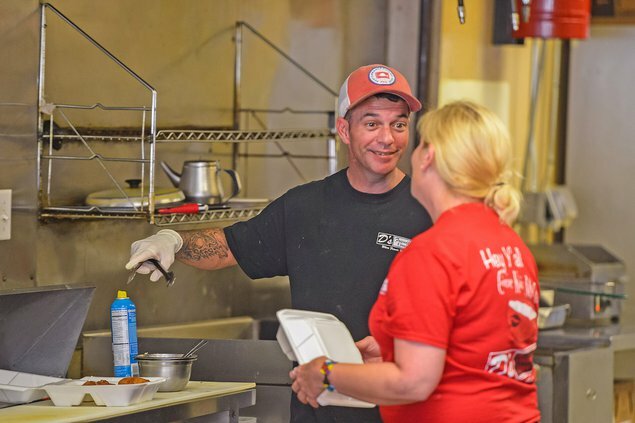 Mr. Omelette moved across town, but Smith’s heart was still in the former location, and she says she missed the customers there a “whole, whole lot.” She soon decided to come back to the original location and open her own restaurant. “It miraculously came together. God had a plan in it. I missed all the regulars. I knew if I got this opened up, they would come back. And they did,” she said. On June 14, 2012, on her birthday, D’s Friendly Diner opened. Smith named the restaurant after her mother’s, which had been called The Friendly Diner and had been located near the current Taco Bell location. She says the customers are what make the restaurant so special. The walls are covered in photographs of the “regulars,” as well as drawings done by them and their gifts to Smith, who points to several of the pictures and recalls details about each one, like surgeries, deaths, anniversaries, trips and birthdays. Smith says the staff and their customers are all like family. Employees Courtney, Michael, Sean and Brian all work for Smith, and are all in recovery. Her daughter works with her part-time, and another employee, Billy, who is not in recovery, has been with her for longer than anyone. Her 11-year-old granddaughter helps out some, and Smith hopes that she will one day want to work with her. It’s important to Smith to hire people in recovery. “Someone gave me a chance, and the miracle of my little diner is watching people get sober and watching their lives change and get better. They make a big impact on customers as well, because people get to watch all of it. It’s a neat thing,” she said, adding that having a job to come to for those in recovery is an important step in the process. Smith says she’s aware that there are a lot of people who suffer with mental illness and addiction. Her son, Buddy, passed away two years ago in October, and his picture hanging on the wall in the restaurant is a bittersweet reminder of what that suffering can bring. “I think it’s really important for people to know that drug abuse and alcoholism is a disease. It’s really important for people to know that,” she said. 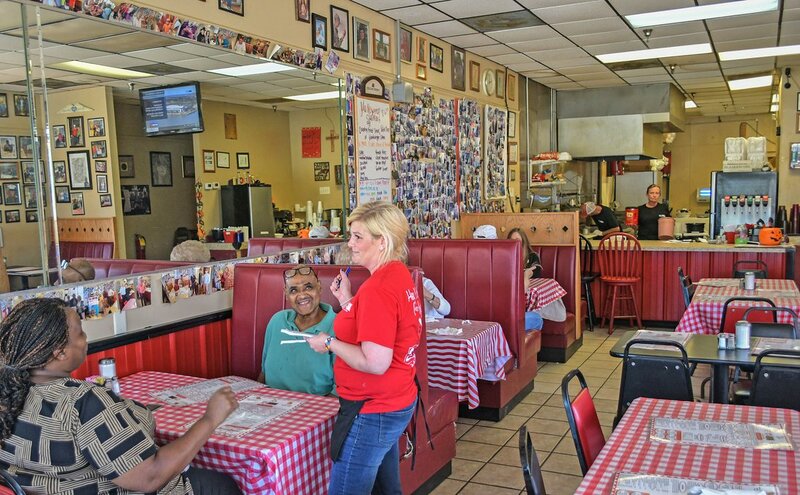 Smith also welcomes those who are homeless to the diner, and often offers them a free meal and help to find a place to stay, or provides them with clothing and shoes. Her own time as homeless has opened her heart toward them, and she gets upset when others judge them. As for her regular customers, Smith says they come first. They celebrate happy occasions together, as well as the milestones in life. Smith is aware that her life is vastly different from where it was before, and she is extremely grateful. “I would have never in a million years imagined my life would be this full and awesome. A lot of it is because of my little diner. I like to refer to it at times as a little piece of heaven. I find much peace in that. It serves a huge purpose in my life,” she said. The restaurant is open seven days a week; Monday through Saturday from 6:30 a.m. to 2 p.m., and on Sunday, from 7 a.m. to 2 p.m. Smith says their biggest crowd is there for breakfast, but they also have a small lunch crowd. During the week, she says business is 70 percent breakfast, 30 percent lunch. On the weekend, 90 percent of their business is breakfast. Smith has been offered the option of expanding into the retail space next door, and has even been encouraged to open a second location. But she is content with things just the way they are, and says she doesn’t ever want to move from her current location. Smith says the Statesboro community has come to mean so much to her since she became sober, and she’s developed some great friendships. She also commented that Statesboro is a great “recovery town,” with many halfway houses, outpatient programs, and Alcoholics Anonymous and Al Anon meetings. Smith says her son didn’t die as a direct result of drug addiction, but it was definitely a factor that led to his heart disease. “Mental illness is something that is really close to my heart because of my son, as well as many, many more who suffer from it. I want to get more involved in issues such as these, doing more service work and so forth,” she said. Being able to help others has meant everything to her.